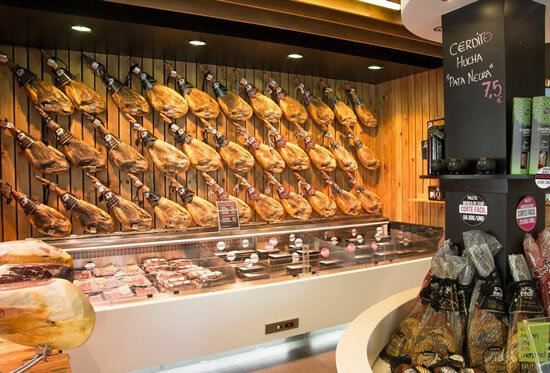 The question that the consumer most frequently poses is how to choose and buy a good Serrano Ham (Jamón Serrano) since, from the point of view of external appearance, it is not always easy to make this decision. If we look at some aspects that we will comment, the piece teaches us some things that may be interesting in these external attributes. 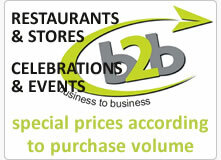 The label. It should be verified that the label includes the name "Jamón Serrano". The piece. We must focus on external aspects such as appearance, color, fat and morphology. Summary. 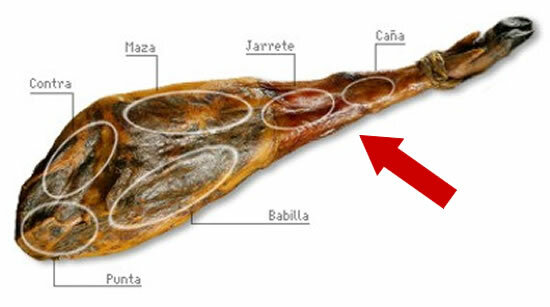 A well presented piece, fulfilling all the indications, will be an excellent candidate to be chosen as its Serrano Ham. 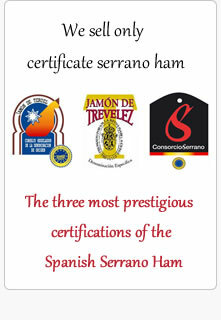 First and fundamentally, the ham has to be Serrano. To verify that this is true, we will have to verify that the label includes the name "Jamón Serrano" as a traditional specialty guaranteed and also about the same it include the months of healing (drying time). In this case, being the product covered by the traditional specialty guaranteed, the drying time has to be more than 7 months. 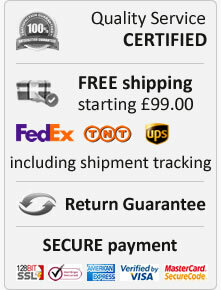 If we have access to the back of the piece, we will usually find a stamp in ink or fire, indicating the week and the year in which the product has entered into drying time. Therefore, this circumstance will corroborate the maturation time of the piece. We will begin with the areas known as "Caña" and "Jarrete". It should be checked that this area has a rounded shape, with no excess of grooves which could be an indicator of excessive drying time and hardening. We continue to observe the rest of the ham. We must select the piece that presents a homogeneity both on the surface and the color of the same, so that there are no grooves or grooves that could indicate an excessive drying of this muscular face. This would be indicative of likely curing excess. 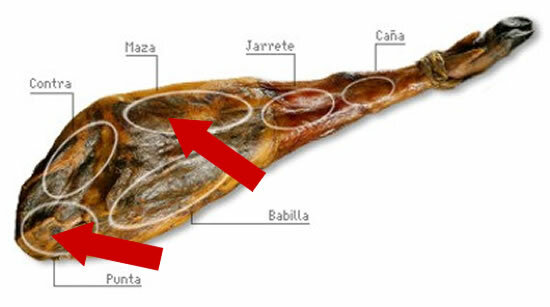 Another aspect, perhaps of the most important to observe in the piece of Spanish Serrano Ham, is the fat cover. We can not forget that fat is the fundamental element that provides flavor to the meat, so a fatty content of a certain level is desirable. This circumstance can be observed in the widest part of the ham, usually called "Maza", where this fat cover must cover the lateral area of this "Maza" and continue towards the "Punta" (ham extremity), in which we must observe and evaluate visually that fat cover thickness is at least one and a half centimeter. The color of the fat is also important. It must be white or yellowish white, that is, it is desirable that the fat is not excessively oxidized, which we can verify by this color. The more brown or more orange colors will indicate a possible excessive oxidation of the fat. 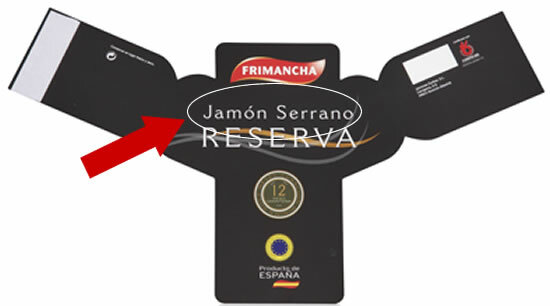 1.- Denomination Jamón Serrano on the label. 2.- Drying time that will also appear on the label and engraved with fire or ink on the back side. 3.- On the skin, fat cover and color of the same. 4. Absence of clefts and cracks throughout the muscular face. But now we are going to compare some of the elements mentioned above to see the differences between what we have established as a more desirable ham and another ham that probably inside is well but which, by its external attributes, would initially be rejected. In the ideal piece we will always find an appearance with a uniform surface, without cracks or grooves. The fat, in the case of the less desirable hams, will be scarce. In addition, in hams less recommended, this fat has an orange color. Finally, a ham without label and without indications is not recommended. 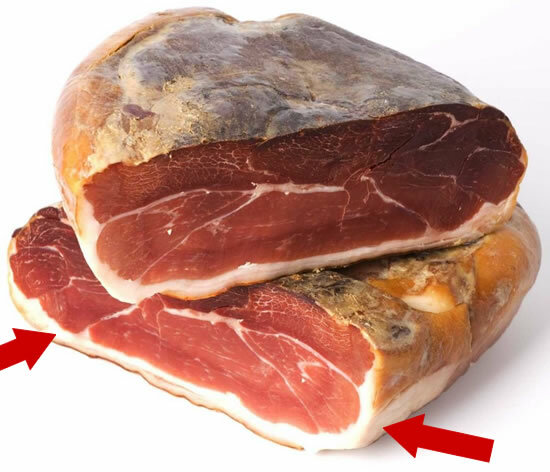 A well labeled ham, with the guarantee of the denomination "Jamón Serrano" in the label and with the indication of the drying time would be a desirable ham.